Finally, one of the most anticipated luxury hatchback BMW 1 Series has arrived in the Indian car market. The luxury car maker has introduced this hatchback in both petrol and diesel engine options. Here, the diesel version of BMW 1 Series has been introduced in three trim levels out of which BMW 1 Series 118d Sport Plus is the top end variant available in its model lineup. This version of this hatchback series has been equipped with a 2.0-litre, four cylinder, twin turbo based diesel mill that can produce a displacement capacity of about 1995cc. This hatchback comes with an overall length of about 4324mm, which is very unusual in the hatchback segment. However, the company hasn't compromised on the interior space and comfort aspects, which have been designed purely for the uber cool car enthusiasts. On the other hand, the company has introduced this hatch at a competitive price tag, which will make it very competitive in the luxury hatchback segment. The company placed this new vehicle against the recently introduced luxury hatchbacks like Mercedes A Class, B Class and the Volvo V40 as well. This new hatch from the German auto giant has been introduced with an 8-speed automatic transmission gearbox, which is now becoming a standard feature in all the BMW car models. This top end model has been offered with additional features like a panoramic sunroof, rear air con vents, key less entry and so on. The exterior design of this premium hatchback is excellent and comes with a sophisticated overall body design. There is no doubt that you will fall in love with this vehicle as soon as you take a first look at it. This is an ideal vehicle for all those, who like to have a BMW car in their garage, but couldn't actually spend pots of money on it. On its front facade, you can observe very expressive headlight cluster that comes with a dual tone look and incorporates projector lamps in it. This head lamp cluster has a kidney bean shaped chrome radiator grille in the center that adds style and richness to the front profile. The company logo is placed on top of the hood just above the radiator grille. 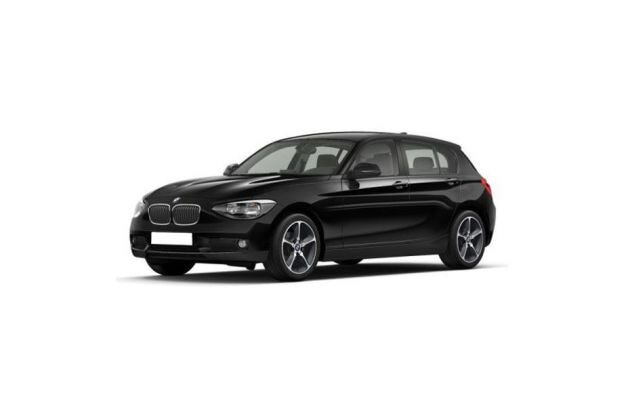 This top end variant BMW 1 Series 118d Sports Plus is offered with a set of 17 inch star spoke styled light alloy wheels that are fitted to the curvy wheel arches. Furthermore, the door handles and the exterior wing mirrors have been painted in body color, while the ORVMs gets integrated with side turn indicators. The entire side profile is very sleek, expressive and stylish that would allow you to make a bold statement on the streets. The rear profile of this hatch is very simple yet stylish. The company has just incorporated a combination based taillight cluster along with a rear spoiler, a high mount stop lamp and a body colored bumper. The interior cabin section of this hatch is truly fascinating and as rich as any other BMW model in the segment. One should step inside this vehicle to experience the true feel of luxury. The company has not compromised on the interior design or the comforts, which indeed resulted in obtaining a rich interior design. Inside environment is dominated by the three spoke multifunction steering wheel that has been equipped with multiple audio and call functions. This steering wheel has got silver accents on top of it along with the iconic BMW company logo fitted in the middle of it. The design of the dashboard is very catchy and trendy, which will steal your attention. After the BMW 6 Series, this new hatchback series is the first model in the company's model lineup to feature a free standing control display, which is placed in the middle, just above the central console. The company offered the interior cabin with a rich black color scheme, which will indeed offer a sporty and rich feel to the passengers. The seats, steering wheel have been wrapped in premium leather upholstery, which will further add to the lavishness of the interiors. When it comes to the engine and technicalities, this top of the line BMW 1 Series 118d Sports Plus variant is fitted with a 2.0-litre twin turbo, 4-cylinder based diesel engine that can produce 1995cc of displacement capacity. This advanced engine has the ability to produce a maximum power output of about 105bhp at 4000rpm, while yielding 320Nm of peak torque in between 1750 to 2500rpm. The company has equipped this twin-turbo diesel engine with an advanced 8-speed automatic transmission gearbox that transfers the engine power to the rear wheels. This will enable 50:50 load distribution and enhances the performance, drive dynamics, stability and fuel efficiency of the vehicle. As far as braking and handling is concerned, both the front and rear wheels of this hatchback have been assembled with highly reliable disc brakes. This disc braking mechanism has been enhanced by Anti-lock braking system, Cornering Brake Control and several other advanced mechanisms. On the other hand, this hatchback has been equipped with an electric power steering system that activates only when you are turning the wheel. It derives the energy from brake energy regeneration system from braking and kinetic energy. This new BMW 1 series 118d Sports Plus diesel trim is blessed with some of the most exciting comfort features along with highly innovative utility features inside. This top of the line variant has been blessed with “Sports Line” features along with several other advanced functions. The list of features including an automatic air conditioner with dual zone climate control with rear air vents, a front sliding armrest, floor mats in velour, an electrical glass roof, a start/stop button function and others. The company also incorporated the sophisticated BMW ConnectDrive system with USB, Bluetooth connectivity, a Hi-Fi loud speaker system, iDrive 16.5cm color display along with CD drive and a controller with direct menu control buttons, a park distance control and many other such aspects. The safety features of this BMW 1 Series 118d Sports Plus trim are unparalleled in comparison to the rest of the models in the segment. Despite being the low cost vehicle in BMW series portfolio, it is offered with technically advanced features that assures protection for all passengers and to the car as well. The features including airbags (for passenger, driver) , front and rear head air bags, side air bags for driver and passenger, ABS, electronic vehicle immobilizer with and crash sensor, side-impact protection and other such advanced features. Pros: Outstanding comfort features, luxurious interior design. Cons: Fuel efficiency needs to improve, price tag can be competitive. BMW 1 Series 2013-2015 is available in 8 different colours - Alpine White, Crimson Red, Mineral Grey, Deep Sea Blue - BMW , Midnight Blue - BMW, Galcier Silver, Valencia orange, Black Sapphire.